In this document, we’ll assume your application directory is <home>/app, and that its build directory is <home>/app/build. (These terms are defined in the following Overview.) On Linux/macOS, <home> is equivalent to ~, whereas on Windows it’s %userprofile%. Zephyr’s build system is based on CMake. The build system is application-centric, and requires Zephyr-based applications to initiate building the kernel source tree. The application build controls the configuration and build process of both the application and Zephyr itself, compiling them into a single binary. Zephyr’s base directory hosts Zephyr’s own source code, its kernel configuration options, and its build definitions. The files in the application directory link Zephyr with the application. This directory contains all application-specific files, such as configuration options and source code. CMakeLists.txt: This file tells the build system where to find the other application files, and links the application directory with Zephyr’s CMake build system. This link provides features supported by Zephyr’s build system, such as board-specific kernel configuration files, the ability to run and debug compiled binaries on real or emulated hardware, and more. Kernel configuration files: An application typically provides a configuration file (usually called prj.conf) that specifies application-specific values for one or more kernel configuration options. These application settings are merged with board-specific settings to produce a kernel configuration. The Kconfig Configuration section below goes over application configuration in detail. Application source code files: An application typically provides one or more application-specific files, written in C or assembly language. These files are usually located in a sub-directory called src. Once an application has been defined, you can use CMake to create project files for building it from a directory where you want to host these files. This is known as the build directory. Application build artifacts are always generated in a build directory; Zephyr does not support “in-tree” builds. You must create a build directory yourself, and call cmake from there. The Zephyr build system does not create build directories for you. The following sections describe how to create, build, and run Zephyr applications, followed by more detailed reference material. Create an application directory on your workstation computer, outside of the Zephyr base directory. Usually you’ll want to create it somewhere under your user’s home directory. It’s recommended to place all application source code in a subdirectory named src. This makes it easier to distinguish between project files and sources. Create an empty CMakeLists.txt file in your application directory. Place your application source code in the src sub-directory. For this example, we’ll assume you created a file named src/main.c. Configure features used by your application. Zephyr’s configuration uses the same Kconfig and Device Tree systems used by the Linux kernel, but with its own configuration trees. Usually, you just create a file named prj.conf in your application directory, where you enable or disable features provided by Zephyr’s Kconfig configuration system. Optionally you can also configure any Device Tree overlays needed by your application (this is usually not necessary; see Device Tree Overlays below for more details). You can use existing samples to get started. For more information, see Application Configuration below. ZEPHYR_BASE: Sets the path to the Zephyr base directory. This is usually an environment variable set by the zephyr-env.sh script on Linux/macOS or manually on Windows, as you learned when getting started with Zephyr in Building and Running an Application. You can also set ZEPHYR_BASE: explicitly on Linux and macOS if you want to. BOARD: Selects the board that the application’s build will use for the default configuration. This can be defined in the environment, in your application’s CMakeLists.txt file, or in the cmake command line. CONF_FILE: Indicates the name of one or more configuration fragment files. Multiple filenames are separated by a single space. Each file includes Kconfig configuration values that override the default configuration values. Like BOARD, this can also be defined in the environment, in your application’s CMakeLists.txt file, or in the cmake command line. DTC_OVERLAY_FILE: Indicates the name of one or more Device Tree overlay files. Each file includes Device Tree values that override the default DT values. Like CONF_FILE, this can also be defined in the environment, in your application’s CMakeLists.txt file, or in the cmake command line. The Zephyr build system compiles and links all components of an application into a single application image that can be run on simulated hardware or real hardware. As described in A brief note on the Zephyr build system, on Linux and macOS you can choose between the make and ninja generators, whereas on Windows you need to use ninja . For simplicity we will use ninja throughout this guide. Navigate to the application directory <home>/app. Enter the following commands to build the application’s zephyr.elf image using the configuration settings for the board type specified in the application’s CMakeLists.txt. If desired, you can generate project files for a different board type than the one specified in the application’s CMakeLists.txt by defining the environment variable BOARD. Both the CONF_FILE and BOARD parameters can be specified when building the application. build.ninja, which can be invoked to build the application. A zephyr directory, which is the working directory of the generated build system, and where most generated files are created and stored. .config, which contains the configuration settings used to build the application. Various object files (.o files and .a files) containing compiled kernel and application code. 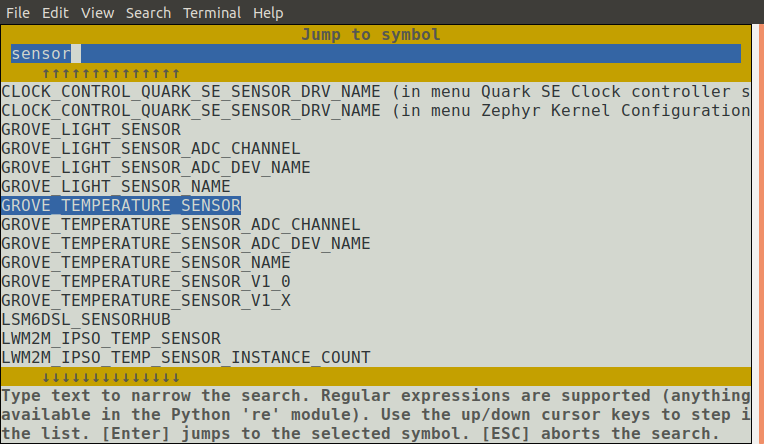 zephyr.elf, which contains the final combined application and kernel binary. Other binary output formats, such as .hex and .bin, are also supported. Application development is usually fastest when changes are continually tested. Frequently rebuilding your application makes debugging less painful as the application becomes more complex. It’s usually a good idea to rebuild and test after any major changes to the application’s source files, CMakeLists.txt files, or configuration settings. The Zephyr build system rebuilds only the parts of the application image potentially affected by the changes. Consequently, rebuilding an application is often significantly faster than building it the first time. Open a terminal console on your host computer, and navigate to the build directory <home>/app/build. Enter the following command to delete the application’s generated files, except for the .config file that contains the application’s current configuration information. Alternatively, enter the following command to delete all generated files, including the .config files that contain the application’s current configuration information for those board types. Rebuild the application normally following the steps specified in Build an Application above. An application image can be run on a real board or emulated hardware. Build your application, as described in Build an Application. Make sure your board is attached to your host computer. Usually, you’ll do this via USB. The Zephyr build system integrates with the board support files to use hardware-specific tools to flash the Zephyr binary to your hardware, then run it. Each time you run the flash command, your application is rebuilt and flashed again. In cases where board support is incomplete, flashing via the Zephyr build system may not be supported. If you receive an error message about flash support being unavailable, consult your board’s documentation for additional information on how to flash your board. When developing on Linux, it’s common to need to install board-specific udev rules to enable USB device access to your board as a non-root user. If flashing fails, consult your board’s documentation to see if this is necessary. Build your application for one of the QEMU boards, as described in Build an Application. Press Ctrl A, X to stop the application from running in QEMU. The application stops running and the terminal console prompt redisplays. Each time you execute the run command, your application is rebuilt and run again. In cases where the board or platform you are developing for is not yet supported by Zephyr, you can add the board definition to your application and build for this board without having to add it to the Zephyr tree. The structure needed to support out-of-tree board development is similar to how boards are maintained in the Zephyr tree. By using this structure, it will be much easier to upstream your board work into the Zephyr tree after your initial development is done. Documentation (under doc/) and support files (under support/) are optional, but will be needed when submitting to Zephyr. cmake -DBOARD=<board name> -DBOARD_ROOT=<path to boards> .. This will use your custom board configuration and will generate the Zephyr binary into your application directory. You can also define the BOARD_ROOT variable in the application CMakeLists.txt file. This section is a quick hands-on reference to start debugging your application with QEMU. Most content in this section is already covered in QEMU and GNU_Debugger reference manuals. In this quick reference, you’ll find shortcuts, specific environmental variables, and parameters that can help you to quickly set up your debugging environment. The simplest way to debug an application running in QEMU is using the GNU Debugger and setting a local GDB server in your development system through QEMU. You will need an Executable and Linkable Format (ELF) binary image for debugging purposes. The build system generates the image in the build directory. By default, the kernel binary name is zephyr.elf. The name can be changed using a Kconfig option. We will use the standard 1234 TCP port to open a GDB server instance. This port number can be changed for a port that best suits the development environment. You can run QEMU to listen for a “gdb connection” before it starts executing any code to debug it. will setup Qemu to listen on port 1234 and wait for a GDB connection to it. -S Do not start CPU at startup; rather, you must type ‘c’ in the monitor. -s Shorthand for -gdb tcp::1234: open a GDB server on TCP port 1234. The build system will start a QEMU instance with the CPU halted at startup and with a GDB server instance listening at the TCP port 1234. Using a local GDB configuration .gdbinit can help initialize your GDB instance on every run. In this example, the initialization file points to the GDB server instance. It configures a connection to a remote target at the local host on the TCP port 1234. The initialization sets the kernel’s root directory as a reference. Substitute ZEPHYR_BASE for the current kernel’s root directory. The GDB version on the development system might not support the –tui option. Please make sure you use the GDB binary from the SDK which corresponds to the toolchain that has been used to build the binary. Finally, the command below connects to the GDB server using the Data Displayer Debugger (ddd). The command loads the symbol table from the elf binary file, in this instance, the zephyr.elf file. The DDD may not be installed in your development system by default. Follow your system instructions to install it. For example, use sudo apt-get install ddd on an Ubuntu system. ddd --gdb --debugger "gdb zephyr.elf"
Both commands execute the gdb. The command name might change depending on the toolchain you are using and your cross-development tools. CMake supports generating a project description file that can be imported into the Eclipse Integrated Development Environment (IDE) and used for graphical debugging. The GNU MCU Eclipse plug-ins provide a mechanism to debug ARM projects in Eclipse with pyOCD, Segger J-Link, and OpenOCD debugging tools. The following tutorial demonstrates how to debug a Zephyr application in Eclipse with pyOCD in Windows. It assumes you have already installed the GCC ARM Embedded toolchain and pyOCD. Download and install Eclipse IDE for C/C++ Developers. In Eclipse, install the GNU MCU Eclipse plug-ins by opening the menu Window->Eclipse Marketplace..., searching for GNU MCU Eclipse, and clicking Install on the matching result. Configure the path to the pyOCD GDB server by opening the menu Window->Preferences, navigating to MCU, and setting the Global pyOCD Path. At a command line, configure your environment to use the GCC ARM Embedded compiler as shown in Using Custom and 3rd Party Cross Compilers. Navigate to a folder outside of the Zephyr tree to build your application. “The build directory is a subdirectory of the source directory. Configure your application with CMake and build it with ninja. Note the different CMake generator specified by the -G"Eclipse CDT4 - Ninja" argument. This will generate an Eclipse project description file, .project, in addition to the usual ninja build files. In Eclipse, import your generated project by opening the menu File->Import... and selecting the option Existing Projects into Workspace. Browse to your application build directory in the choice, Select root directory:. Check the box for your project in the list of projects found and click the Finish button. This is optional. It provides the SoC’s memory-mapped register addresses and bitfields to the debugger. Click the Debug button to start debugging. Experimental support for Zephyr RTOS awareness is implemented in pyOCD PR #333. It is compatible with GDB PyOCD Debugging in Eclipse, but you must download this pull request and build pyOCD from source. You must also enable CONFIG_OPENOCD_SUPPORT=y in your application. CMake is used to build your application together with the Zephyr kernel. A CMake build is done in two stages. The first stage is called configuration. During configuration, the CMakeLists.txt build scripts are executed. After configuration is finished, CMake has an internal model of the Zephyr build, and can generate build scripts that are native to the host platform. CMake supports generating scripts for several build systems, but only Ninja and Make are tested and supported by Zephyr. After configuration, you begin the build stage by executing the generated build scripts. These build scripts can recompile the application without involving CMake following most code changes. However, after certain changes, the configuration step must be executed again before building. The build scripts can detect some of these situations and reconfigure automatically, but there are cases when this must be done manually. Zephyr uses CMake’s concept of a ‘target’ to organize the build. A target can be an executable, a library, or a generated file. For application developers, the library target is the most important to understand. All source code that goes into a Zephyr build does so by being included in a library target, even application code. In the above CMakeLists.txt, an existing library target named app is configured to include the source file src/main.c. The PRIVATE keyword indicates that we are modifying the internals of how the library is being built. Using the keyword PUBLIC would modify how other libraries that link with app are built. In this case, using PUBLIC would cause libraries that link with app to also include the source file src/main.c, behavior that we surely do not want. The PUBLIC keyword could however be useful when modifying the include paths of a target library. Every application must have a CMakeLists.txt file. This file is the entry point, or top level, of the build system. The final zephyr.elf image contains both the application and the kernel libraries. This section describes some of what you can do in your CMakeLists.txt. Make sure to follow these steps in order. Refer to Supported Boards for more information on available boards. Any previously used value as determined by the CMake cache takes highest precedence. This ensures you don’t try to run a build with a different BOARD value than you set during the build configuration step. Any value given on the CMake command line using -DBOARD=YOUR_BOARD will be checked for and used next. If an environment variable BOARD is set, its value will then be used. Finally, if you set BOARD in your application CMakeLists.txt as described in this step, this value will be used. If your application uses a configuration file or files other than the usual prj.conf (or prj_YOUR_BOARD.conf, where YOUR_BOARD is a board name), add lines setting the CONF_FILE variable to these files appropriately. If multiple filenames are given, separate them by a single space. More details are available below in Kconfig Configuration. If your application uses a Device Tree overlay file or files other than the usual <board>.overlay, add lines setting the DTC_OVERLAY_FILE variable to these files appropriately. More details are available below in Device Tree Overlays. If your application has its own kernel configuration options, add a line setting the location of the Kconfig file that defines them. An (unlikely) advanced use case would be if your application has its own unique configuration options that are set differently depending on the build configuration. If you just want to set application specific values for existing Zephyr configuration options, refer to the CONF_FILE description above. # Your application configuration options go here. Environment variables in source statements are expanded directly, so you do not need to define a option env="ZEPHYR_BASE" Kconfig “bounce” symbol. If you use such a symbol, it must have the same name as the environment variable. See the Kconfig extensions and changes section in the Board Porting Guide for more information. A BOARD-specific configuration file, stored in boards/ARCHITECTURE/BOARD/BOARD_defconfig in the Zephyr base directory. One or more application-specific configuration files. The application-specific configuration file(s) can be specified in any of the following ways. The simplest option is to just have a single prj.conf file. If CONF_FILE is set in CMakeLists.txt (before including the boilerplate.cmake file), or is present in the CMake variable cache, the configuration files specified in it are merged and used as the application-specific settings. Alternatively, an application may define a CMake command, macro, or function called set_conf_file, which is invoked and is expected to set CONF_FILE. Otherwise (if (1.) does not apply), if a file prj_BOARD.conf exists in the application directory, where BOARD is the BOARD value set earlier, the settings in it are used. Otherwise, if a file prj.conf exists in the application directory, the settings in it are used. Otherwise, there are no application-specific settings, and just the settings in the BOARD-specific configuration are used. Configuration settings that are specified in neither the BOARD configuration file nor in the application configuration file(s) fall back on their default value, as given in the Kconfig files. The merged configuration is saved in zephyr/.config in the build directory. As long as zephyr/.config exists and is up-to-date (is newer than the BOARD and application configuration files), it will be used in preference to producing a new merged configuration. This can be used during development, as described below in Overriding the Default Configuration. For more information on Zephyr’s Kconfig configuration scheme, see the Setting configuration values section in the Board Porting Guide. For information on available kernel configuration options, including inter-dependencies between options, see the Configuration Symbol Reference. Dependencies between options can also be viewed in the interactive configuration interface, which is explained in the Overriding the Default Configuration section. It will have the most up-to-date dependencies, and also shows which dependencies are currently unsatisfied. To view the dependencies of an option in the configuration interface, jump to it with / and press ?. For each unsatisfied dependency, jump to it in turn to check its dependencies. This section describes how to edit Zephyr configuration (.conf) files. Add each configuration entry on a new line. Ensure that each entry setting an option contains no spaces (including on either side of the = sign). An interactive configuration interface is available for making temporary changes to the configuration. This can be handy during development. The configuration can also be changed by editing zephyr/.config in the application build directory by hand. Using the configuration interface is safer, as it correctly handles dependencies between configurations symbols. To make a setting permanent, you should set it in a .conf file, as described above in Setting Application Configuration Values. Use the arrow keys to navigate the menu. Common Vim key bindings are supported as well. Press Enter or Space to enter submenus and choices, which appear with ---> next to them. Press ESC returns to the parent menu. Press Space to toggle or configure a symbol value. Boolean configuration symbols are shown with [ ] brackets, while numeric and string-valued configuration symbols are shown with ( ) brackets. You can also press Y or N to set a boolean configuration symbol, to the corresponding value. Press ? to display information about the currently selected symbol. Press ESC or Q to return from the information display to the menu. Press Y to save the kernel configuration options to the default filename (zephyr/.config). Typically, you will save to the default filename unless you are experimenting with various configuration scenarios. At present, the configuration file used during building is always zephyr/.config. If you have another saved configuration that you want to build with, copy it to zephyr/.config. Make sure to back up your original configuration file. Also note that filenames starting with . are not listed by ls by default on Linux and macOS. Use the -a flag to see them. If you jump to a symbol that isn’t currently visible (e.g., due to having unsatisfied dependencies) then show-all mode will be enabled. In show-all mode, all symbols are displayed, including currently invisible symbols. To disable show-all mode, press A.
Show-all mode can’t be disabled if there are no visible items in the menu. To figure out why a symbol you jumped to isn’t visible, inspect its dependencies by pressing ?. If you discover that the symbol depends on another symbol that isn’t enabled, you can jump to that symbol, in turn, to see if it can be enabled. As described in Device Tree in Zephyr, Zephyr uses Device Tree to describe the hardware it runs on. This section describes how you can modify an application build’s device tree using overlay files. Overlay files, which customarily have the .overlay extension, contain device tree fragments which add to or modify the device tree used while building a Zephyr application. To add an overlay file or files to the build, set the CMake variable DTC_OVERLAY_FILE to a whitespace-separated list of your overlay files. The file common.dts conditionally includes device tree fragments based on Kconfig settings. For example, it includes a fragment for MCUboot chain-loading, located at dts/common/mcuboot.overlay, if CONFIG_BOOTLOADER_MCUBOOT is set. Any file or files given by the DTC_OVERLAY_FILE CMake variable. Any value given to DTC_OVERLAY_FILE in your application CMakeLists.txt (before including the boilerplate.cmake file), passed to the the CMake command line, or present in the CMake variable cache, takes precedence. The environment variable DTC_OVERLAY_FILE is checked next. This mechanism is now deprecated; users should set this variable using CMake instead of the environment. If the file BOARD.overlay exists in your application directory, where BOARD is the BOARD value set earlier, it will be used. If DTC_OVERLAY_FILE specifies multiple files, they are included in order by the C preprocessor. After running the preprocessor, the final device tree used in the build is created by running the device tree compiler, dtc, on the preprocessor output. Application-specific source code files are normally added to the application’s src directory. If the application adds a large number of files the developer can group them into sub-directories under src, to whatever depth is needed. Application-specific source code should not use symbol name prefixes that have been reserved by the kernel for its own use. For more information, see Naming Conventions. It is possible to build library code outside the application’s src directory but it is important that both application and library code targets the same Application Binary Interface (ABI). On most architectures there are compiler flags that control the ABI targeted, making it important that both libraries and applications have certain compiler flags in common. It may also be useful for glue code to have access to Zephyr kernel header files. To make it easier to integrate third-party components, the Zephyr build system has defined CMake functions that give application build scripts access to the zephyr compiler options. The functions are documented and defined in $ZEPHYR_BASE/cmake/extensions.cmake and follow the naming convention zephyr_get_<type>_<format>. The following variables will often need to be exported to the third-party build system. 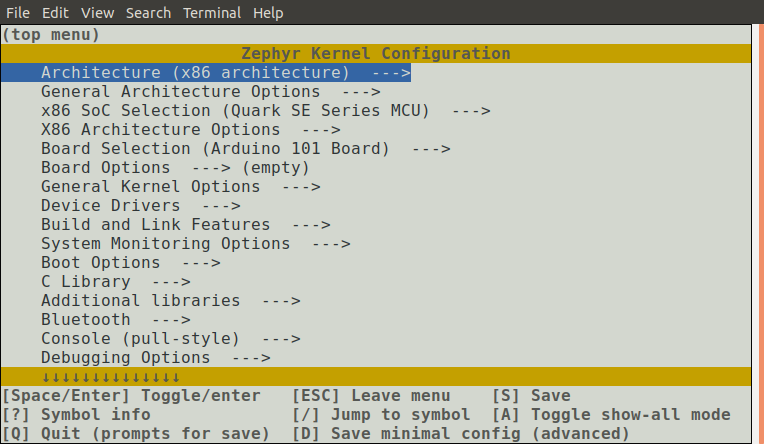 ARCH and BOARD, together with several variables that identify the Zephyr kernel version. samples/application_development/external_lib is a sample project that demonstrates some of these features.